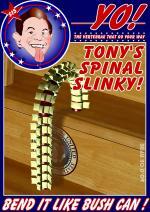 Anorak News | Will George Bush Give Tony Blair What He Wants? Will George Bush Give Tony Blair What He Wants? THERE they go in their matching dark blue Burberry jumpers (RRP: £90). Having developed the stiff-armed George Bush swagger, Tony Blair might now be wearing a jumper just like the one he gave his pal at the G8 summit. What George gave Tony in return, we don’t know. And the thinking is that rather than taking the white Stetson, spurs, buckle and belt for himself, John Prescott was working on his master’s behalf. If this is the case – and it is only our guess that it is – Tony would be wise to keep any such gifts under wraps. An ICM poll in the Guardian says 63% of Brits think our leader (Tony) is too closely linked to the United States. That’s against 30% of us who think the Prime Minister has got the relationship pretty much right. But back to the gifts. According to the website of the Cabinet Office, which lists all ministerial gifts received valued at over £140, the Secretary of State of Defence was given a gold ornate dagger by the Kingdom of Saudi Arabia in March last year. In September this year the Danish Government gave him a sword. Is this a kind of one-upmanship? Will the Saudis now give Des Browne a big sword, followed by the Danes giving him a canteen of swords, and so on until Mr Browne has the means to launch an invasion of France and a really flashy dinner party? And last year, French President Jacques Chirac gave Tony a gift of wine. In all, he gave the Prime Minister four boxes of wine. Very nice, you’d think. Bu the Times says Tony has four times looks at the wine and four Times turned his nose up. According to the Cabinet Office, the four consignments of wine are still “held by the Prime Minister’s office”. Tony has yet to imbed them in his personal cellar. But why? As the Times says, Tony is partial to full-bodied red wine, “but is a Chianti rather than a Bordeaux or Burgundy man.” Is this why he did not take the wine home, because he doesn’t like it? Or is it because he and Chirac have had tiffs over Iraq and European farm subsidies? He doesn’t like Chirac? The Times wonders. And it wonders if this wine is too expensive. As the paper says, Chirac sent a half case of wine to Tony to enjoy on his 50th birthday. It was good stuff, 1989 Chateau Mouton Rothschild, retailing at £195 a bottle. Problem was that Whitehall rules meant the Prime Minister had to pay for it from his own pocket. It cost him over £1,000. So the wine sits in the Prime Minster’s Office, possibly in a filing cabinet. And Tony rocks back in his chair, tips his cowboy hat back, puts his boots on the desk and wonders when he will get another gift. When will George give him a shiny US star to complete his outfit?